Do you think you might have yellow teeth? Or could your teeth just be a little whiter and brighter? There are many different types of discolouration that can occur, resulting in stains on the enamel, or surface, of your teeth. These stains are usually caused by tartar build-up from a number of different sources. So, the best way to avoid stained teeth is to avoid the food, drinks and other items that are causing these stains. Intrinsic: this type of staining occurs when your dentine (the hard, calcareous tissue that makes up the majority of your tooth and is found underneath the enamel) has darkened and takes on a yellow tint. Extrinsic: these tooth stains are superficial, and occur when your tooth enamel is stained by the consumption of the foods or drinks mentioned above, or smoking. Usually, extrinsic tooth stains are easily treated with polishing or bleaching. Age-related: this type of stained tooth is both Intrinsic and Extrinsic. It occurs because, over time, your dentin naturally turns yellow as the enamel becomes thinner and more porous. In the best-case scenario, we may be able to simply use teeth whitening techniques. Some stains can also be removed with the use of a mild acid agent and mixed pumice. 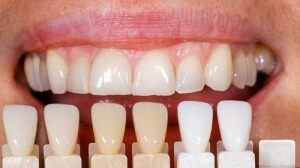 This technique is very useful with fluorosis stains (white markings from excess fluoride). If the stains on your teeth are a little more difficult to remove, we may also need to use composite veneers or porcelain veneers, particularly in the case of tetracycline. If, on other hand, you have intrinsic stained teeth, as the result of an injury, or the nerve dying, then we may need to treat this both internally as well as externally to get the best possible result. Internal whitening of discoloured teeth caused by nerve death is very simply done by placing diluted sodium perporate inside the tooth over several weeks. Its called ‘walking whitening’ since you have to do nothing except walk and wait!